raàyepèye rehneh, rehneh ye enah ri is a language created by MilyAMD for the 24-hour speedlanging challenge on the ZBB. 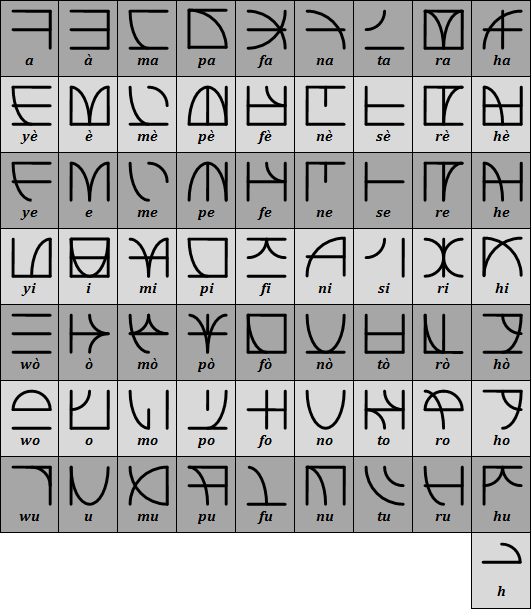 Syllabary used for the language. The CR 19 torch written in the syllabary. Stress on the first closed syllable; when none in a word, then initial. Singular for double nouns: i (after /h/), yih (after V). feròh /ɸeˈɾɔh/ "(two) eyes" → feròh'i /ɸeˈɾɔhʔi/ "an eye"
yipi /ˈipi/ "(two) legs" → yipiyih /ipiˈih/ "a leg"
Singular for mass nouns: àh (after /h/), ah (after V). woròi /ˈoɾɔʔi/ "hair" → woròiah /oɾɔʔiˈah/ "a hair"
enah /ʔeˈnah/ "people" → enah'àh /ʔeˈnahʔah/ "a person"
sèhhu /ˈtɛhhu/ "stone" → sèhhuhama /ˈtɛhhuhama/ "two stones"
enah → enahhama /ʔeˈnahhama/ "two people"
sèhhu → sèhhuyepè /ˈtɛhhuepɛ/ "stones"
feròh → feròh'èpè /ɸeɾɔhʔɛpɛ/ "(many) eyes"
The pronouns incorporate prepositions, e.g. nè raà → raànè, ye peh → pehe. The present tense uses accusative syntax. It takes suffix u (only after /h/). raà nawò /ˈɾaʔa ˈnaɔ/ "I go"
The accusative marker is ta. raà afoh'u ta sèhhu /ˈɾaʔa aˈɸohʔu ta ˈtɛhhu/ "I grasp a stone"
The past tense is used with ergative syntax. It takes suffix misi. raà nawòmisi /ˈɾaʔa ˈnaɔmiti/ "I went"
sèhhu afohmisi /ˈtɛhhu aˈɸohmiti/ "someone grasped a stone"/ "a stone was grasped"
The ergative marker is nè. sèhhu raànè afohmisi /ˈtɛhhu ˈɾaʔanɛ aˈɸohmiti/ "I grasped a stone"
The irrealis mood is constructed with the past of mòhhòh "to wish", "to conceive"
nawò mòhhòhmisi nè enah /ˈnaɔ mɔhhɔhmiti nɛ ʔeˈnah/ "people would go"
mòhhòhmisi afoh ta sèhhuyepè nè enah /ˈmɔhhɔhmiti aˈɸoh ta ˈsɛhhuepɛ nɛ eˈnah/ "people would grasp stones"
This page was last modified on 28 May 2014, at 05:42.